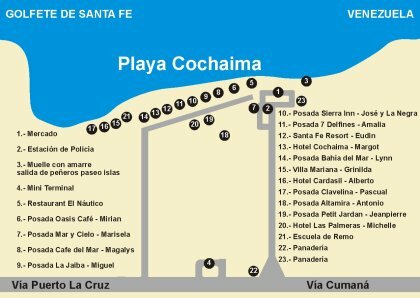 Where the heck is Playa Cochaima? Well, it's in Santa Fé of course. OK, how are you at following signs? 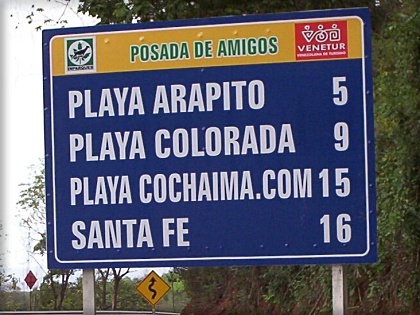 If you are driving from Puerto la Cruz we've put in signs like these to show the way - We're remote, but civilized. From Puerto La Cruz - You're practically here already. Just 1 hour(OK, maybe an hour and a 1/2) east and you'll be at the Venezuela you were looking for all along! Just go to the terminal and ask for a bus to Cumaná and then notify the bus driver you want to get out at Santa Fé. Sit on the left side of the bus for the best views. 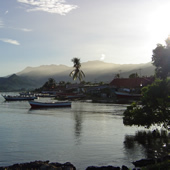 From Margarita - Did you know there are 5 ferries between Puerto La Cruz and Isla Margarita every day? Imagine, in a couple of hours you can be in the real Venezuela! And if you pay our time, we'll even pick you up at the ferry terminal(great for a group) or else just take a taxi to the bus terminal in Puerto La Cruz and a por-puesto to Santa Fe(approx. 1 hour). From Caracas - Take a bus to Cumaná and ask to be let out at Santa Fé. They will let you out at #22 on our map(by the panaderia). From there walk to the beach, 1 km and go left to Playa Cochaima. Everyone will know where you are headed and Venezuelans are famously helpful so feel free to ask if you aren't sure. From Cumaná - Go to the terminal de por-puestos by the beach. From there take a por puesto to Santa Fé and you will be let out at #22 on our map(the panaderia). Walk to the beach(1 km) and go left, we are about 200m down the beach. Same goes for you, ask if you aren't sure. People will help.